What is the difference between Creating a Folder and Creating a Test? Express is a plug in for Visual Studio. You can create, execute, and maintain tests in it. It helps collaboration. Testers can work in Test Studio Standalone, then hand tests off to developers if they need to do things like check the database or use support infrastructure. 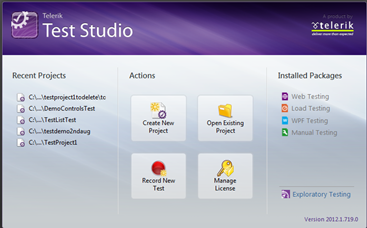 Testers can use Test Studio Express, too, if they’re more comfortable there and like working in Visual Studio. Is this a limitation of test studio that it allows recording in IE ONLY? When we add multiple Tests inside a Test List, After finishing each test, will Test Studio close the window every time and re-launch it for the next test ? By default, yes. You can also select to “Recycle Browser” in the web tab of the test list’s Settings. This will keep the same browser open; however, you have to be very careful about state, session, cookies, etc. Where can we make custom code changes to any particular test step? Yes! You can convert any test step to code by right clickign on it and selecting Convert to Code. You can also add custom code steps. In case I don’t want to record and run the test but i want to do manual coding to create my own automation suite? How TestStudio is helpful for Silverlight OOB applications? Test Studio can be used to test the Silverlight OOB applications as well. Silverlight tests get recorded in exactly the same fashion as the web tests DJ has been showing. The experience is very similar. You can explore the visual tree, etc. Which scripting language is supported by Test studio? If the SAP application renders HTML, Silverlight or WPF then yes! Does it work on other tools than .net? Test Studio will test against any server technology. The demo application is written in Ruby! Do we have any quick start guide on that? Yes, please see tv.telerik.com for some great videos on testing Silverlight! We have separate webinars on performance and load testing! How to simulate multiple users? You can use Load testing feature to simulate multiple users. Will it work for software build using procedural language like Clarion? If the system renders HTML, Silverlight or WPF then Test Studio will work fine with it. If application is publish in citrix can we record and test it? Possibly, there are sometimes difficulties depending on your environment. I hope you had worth of your time in this webinar. Looking forward for your participation in further webinars .. Thank you so much for attending Kendo UI webinar yesterday. We had exciting time and hope you found webinar useful. As promised we are making all the resources of webinar available to download. If you missed the webinar then you can start learning about Kendo UI from here . We strongly recommend you to go ahead and download trial version of Kendo UI from here. If you find any difficulties , throw your questions in comment or can directly send mail to us. If you need any assistance to start with Kendo UI please writes to us. See you soon in next webinar.